Hello everyone! My name is Jason Perry and welcome to the Gish Bar Times, the world's first and only blog dedicated to Jupiter's colorful volcanic moon Io! Have you come to this blog looking for basic information on Io? 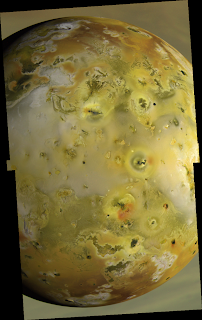 Well many of the posts here may seem a bit overwhelming without a bit of understanding of the main topic, Jupiter's moon Io. On this page, I have organized a list of links that will be helpful to new visitors, as well as a list of overview posts that highlight the latest in Io science. 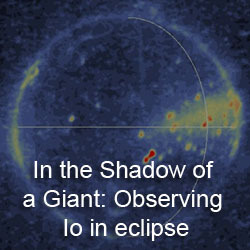 Io is the innermost of the four large moons of Jupiter, also known as the Galilean satellites. Io is a little larger than the Earth's moon but has a surface that couldn't be more different. While the ancient surface of our moon is dominated by impact craters and large basalt "mare" provinces that are 3-4 billion years old, Io's surface is continuously being renewed, with more than 400 volcanic depressions known as a paterae and more than 130 mountains, the vast majority of which are created by tremendous compressional stresses in Io's crust. 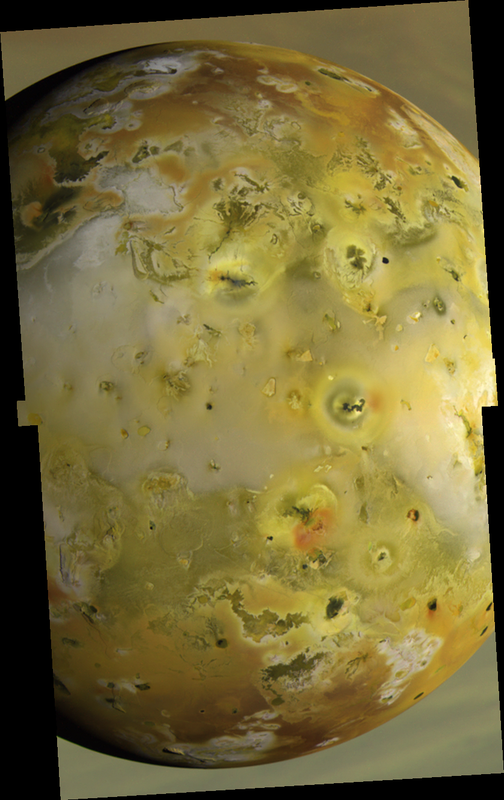 Vigorous volcanic activity coats the surface with basaltic lava, sulfur, and sulfur dioxide frost, making Io one of most colorful planetary bodies in the solar system, with shades of red, green, yellow, and purple splashed across its surface. The engine for Io's volcanism is tidal heating. Io's orbit is slightly eccentric and Jupiter's gravitational pull on Io varies over the course of an Ionian day as the satellite moves closer to or farther from the giant planet. The gravitational pulls of two other Galilean satellites, Europa and Ganymede, prevent Io from circularizing its orbit, so the tidal energy produced is dissipated instead by heating Io's interior. 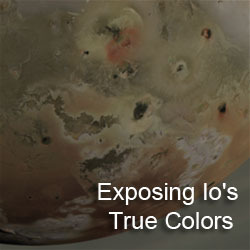 On Wikipedia, check out the Io, Volcanism on Io, and Exploration of Io articles. The first two are featured articles on the online encyclopedia, representing some of the best content there. Plus, I regularly review content changes to those articles in order to maintain their high quality. 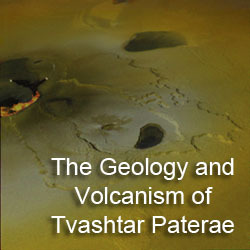 I am also beginning to prepare more articles on several of Io's volcanic features, such as Pele, Masubi, and Tawhaki Vallis, Thor, and Tupan Patera. If you wish to get in touch with me either for a question or to submit a tip for a future article, please use my contact form.